Different types of muscles in the body perform different functions according to their type and location. Muscles are the contractile tissues [A tissue that is able to contract] that are responsible for performing various voluntary and involuntary functions. Muscles can be regarded as motors of the body. In Latin, Mus stands for the mouse. By definition, muscle is a contractile tissue which brings about movements. The muscles are of three types – skeletal, smooth and cardiac. The fourth type – myoepithelial cells are specialized cells in sweat glands. The characters of each type are summarized below. Skeletal muscles are types of muscles which are most abundant and are found attached to the skeleton. They are also called striped, striated, somatic, or voluntary muscles. They exhibit cross-striations under the microscope and are considered to be the best-differentiated form of muscle. They are supplied by somatic (cerebrospinal) nerves, and, therefore, are under voluntary control, with certain exceptions. They respond quickly to stimuli, being capable of rapid contractions, and help in adjusting the individual to an external environment. They also get fatigued very easily. Each muscle fiber of skeletal muscle is a multinucleated cylindrical cell, containing groups of myofibrils. Myofibrils are made up of myofilaments of three types (myosin, actin, and tropomyosin). These are the actual contractile elements of the muscle. Skeletal muscles are under the highest nervous control of cerebral cortex. Examples of these types of muscles are muscles of limbs and body wall, and bronchial muscles are examples of skeletal muscles. Most of the skeletal muscles are attached to two bones, one is called origin and the other is called insertion. Muscles attach to the bones by tendons which are tough bands of connective tissue. Tendons very strong and are woven into the coverings of both muscles and bones. Muscles act by contraction which results in their shortening and pulls on tendons. This transfers the force to bone attached and desired movement results between the bones muscle is attached. The muscle attachment on the stationary bone is called origin and the one on the other bone [which moved] is called insertion. In between the origin and the insertion lies the muscle belly. Skeletal muscle may be named on based on their location [tibialis anterior], site of origin and insertion [sternocleidomastoid], number of origins[ quadriceps], shape [serratus anterior], and function [supinator]. Most of the time, for producing a movement, many muscles act together. The muscle that produces any particular movement of the body is known as an agonist or prime mover. The agonist always pairs with an antagonist muscle that produces the opposite effect on the same bones. 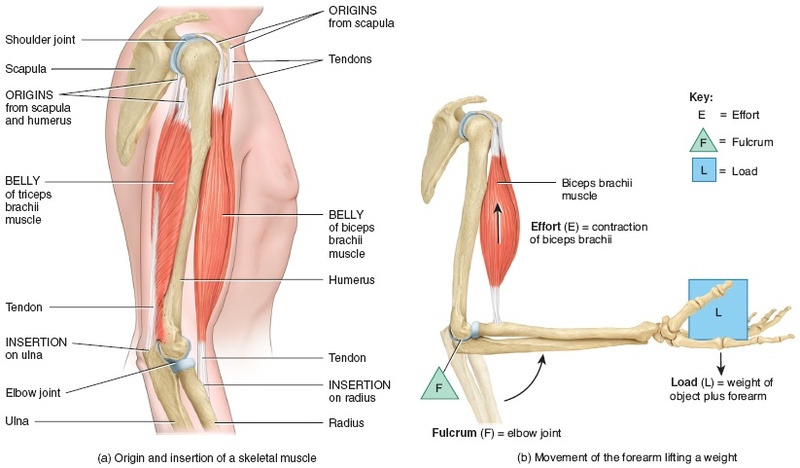 For example, the biceps brachii muscle flexes the arm and the triceps brachii muscle extends the arm at the elbow. So biceps is agonist when the arm is flexed and triceps is the antagonist when the arm extends. When the triceps is extending the arm, the biceps would be considered the antagonist. Synergists are muscles that help to stabilize a movement and reduce extraneous movements to produce smooth functioning. They are usually found in regions near the agonist and often connect to the same bones. Skeletal muscle fibers are highly specialized and contain many unique organelles. The cell membrane of muscle fibers is called the sarcolemma and acts as a conductor for electrochemical signals. T-tubules are transverse tubules that help carry these electrochemical signals into the middle of the muscle fiber. Calcium ions are vital to muscle contraction and are stored in the sarcoplasmic reticulum. Muscle cells are very rich in mitochondria is which function to provide ATP [energy] to active muscles. Most of the muscle fiber’s structure is made up of myofibrils, which are the contractile structures of the cell. Myofibrils are made up of many proteins fibers arranged into repeating subunits called sarcomeres. The sarcomere is the functional unit of muscle fibers. Sarcomeres are made of two types of protein fibers: thick filaments made of myosin protein and thin filaments actin, tropomyosin and troponin. Motor neurons control the movement of muscles. Each motor neuron controls several muscle cells in a group known as a motor unit. When a motor neuron receives stimulates all of the muscles cells in its motor unit at the same time. The number of muscle fibers in a motor unit may vary with muscle. For example, fine muscles like those of fingers have very few muscle fibers in each motor unit to improve them and the muscles that need a lot of strength to perform their function—like leg or arm muscles—have many muscle cells in each motor unit. The body can control a number of motor units to activate or employ for a given function. A neuromuscular junction is a place where neurons bond with the motor end plate, a specialized part of the sarcolemma, and cause release of ions creating an electrochemical gradient inside of the cell, which further opens more ion channels. When the positive ions reach the sarcoplasmic reticulum, Ca2+ ions are released and allowed to flow into the myofibrils and bind to troponin. This binding leads to change in shape of troponin molecule and move tropomyosin away from myosin binding sites on actin. This allows actin and myosin to bind together. Using ATP molecules myosin proteins in the thick filaments bend and pull on actin molecules in the thin filaments.. As the thin filaments are pulled together, the sarcomere shortens and contracts. Contraction of many sarcomeres in a row [myofibril], cause shortening of muscle cells. When a motor neuron stops the release of the neurotransmitter, the process of contraction reverses itself. Calcium returns to the sarcoplasmic reticulum, troponin and tropomyosin return to their resting positions; and actin and myosin are prevented from binding and sarcomeres return to their elongated resting state. Muscles stay partially contracted in the normal state to maintain tone which helps to prevent damage to the muscle and joints and maintains the body’s posture. Muscles use aerobic respiration when we call on them to produce a low to moderate level of force. However, they switch to anaerobic respiration, a less efficient form of respiration when demand is higher. Anaerobic respiration means the respiration occurs without the presence of oxygen whereas aerobic occurs in presence of the oxygen. Myoglobin is a pigment found in muscles, contains iron and stores oxygen in a manner similar to hemoglobin in the blood enabling muscle to continue aerobic respiration in oxygen deficiency. Creatine phosphate and glycogen are other energy providing sources of muscle. Visceral muscle is found inside of organs like the stomach, intestines, and blood vessels. Visceral muscles are the weakest of all the muscles. Their main function is to move substances through the organ. This type of muscles is also called plain, unstriped, non-striated, visceral, or involuntary muscles. These muscles often encircle or surround the viscera. Visceral muscles are also called involuntary muscles as they are controlled by the part of the brain which cannot be directly controlled by the conscious mind. Smooth muscles do not exhibit cross-striations under a microscope, being plain and smooth in form and their uniform appearance, when viewed under a microscope, has led to the term smooth muscle which is in contrast with the striated appearance of skeletal and cardiac muscles. They are supplied by autonomic nerves, and, therefore, are not under voluntary control and respond slowly to stimuli. Smooth muscles are capable of sustained contraction, and, therefore, do not fatigue easily. They provide motor power for regulating the internal environment related to digestion, circulation, secretion, and excretion. Smooth muscles are less dependent on nervous control, being capable of contracting automatically, spontaneously, and often rhythmically and each muscle fiber is an elongated, spindle-shaped cell, with a single nucleus placed centrally; the myofibrils show longitudinal striations. Muscles of the blood vessels, and the arrector pili or erector pili muscles of the skin are examples of smooth muscles. This type of muscle, as the name suggests is found in the heart. It is intermediate in structure, being striated and at the same time involuntary. It is meant for automatic and rhythmic-contractions. These fibers have a single nucleus placed centrally which branches and anastomoses with the neighboring fibers at intercalated discs (apposed cell membranes). The cross-striations are less prominent than those in the skeletal muscle. Cardiac muscle is found only in the heart and is responsible for pumping blood. Cardiac muscle is an involuntary muscle. Cardiac muscle is unique as it stimulates itself to contract by virtue of a pacemaker which is also made of cardiac muscle tissue. Because of this property, cardiac muscle is considered to be autorhythmic or intrinsically controlled. The cells of cardiac muscle tissue are striated—that is, they appear to have light and dark stripes when viewed under a light microscope. The arrangement of protein fibers inside the cells causes these light and dark bands. Striations indicate that a muscle cell is very strong, unlike visceral muscles. The cells of cardiac muscle are branched X or Y shaped cells tightly connected together by f fingerlike projections from two neighboring cells [called intercalated discs] that interlock and provide a strong bond between the cells. The branched structure and intercalated discs allow the muscle cells to resist high blood pressures and the strain of continuous working. These features also help to spread electrochemical signals quickly from cell to cell so that the heart can beat as a unit. These are present at the bases of secretory acini of sweat gland, etc. These help in the expulsion of secretion from the acini. Out of the four kinds of muscles, the skeletal muscles are most abundant in the body. These are the only muscles which are dissected out in the dissection hall and studies individually. The main function of the muscular system is the movement. Skeletal muscles work together with bones and joints to form a lever. The muscle acts as the effort force, the joint acts as the fulcrum, the bone acts as the lever, and the object being moved acts as the load. Another important function of the muscles. The muscles responsible for the body’s posture have the greatest endurance of all muscles in the body as they hold up the body throughout the day without becoming tired. The cardiac and visceral muscles are primarily responsible for transporting substances like blood or food from one part of the body to another. Due to a high metabolic rate of contracting by muscle, heat is produced as a byproduct. This helps to maintain body temperature. Shivering in winters is produced by muscles are working to produce heat. Hey,you have helped me alot,with the different type of information that you give out. Thanks alot and good luck with life. ok this site dosent have the muscle functions…. very disapointed! Thanks Tate. That is quite encouraging. What exactly you are looking for. Let me know and I would see if I can write an article on that. lacks the function of the cross striations in the skeletal muscle fibres. did u have case presentation which will benefit for in exams.means how bpresent case how describe pain ,fever,rom .that will help in exams.if yes mail me.post here and inform me mail. I fear I do not have what you require. Sorry. and development of excretory system in vertebrates and invertebrates. this is the most greatest help i have ever have pls u people should keep it up. horrible website i failed a paper because of you. Thanks. Could you please care to add. Something was wrong with dae display. I have corrected that. Thanks for letting me know. Best of luck for your project. it was really helpful to me ,thanks a lot. I am glad for that. Best of luck.